There are opportunities for success and failure in marketing your brand every single day. Actually understanding – not just guessing or assuming – your target audience on a fundamental level, as well as what they want, is at the foundation of every successful marketing campaign. Without this, moving your brand to total obscurity could be one poorly targeted advertisement away. In 1958, Honda made the decision to enter the U.S. motorcycle market. At this time, the US motorcycle market was dominated by Harley Davidson, Indian, and Triumph. Riders of those motorcycles were exactly who you think of when someone says, “biker.” They were leather-wearing outsiders. Back to Honda, when the Japanese company decided to enter the U.S. market, they went after the leather-wearing biker audience. They built some large motorcycles that could compete with Harley. It was a huge success for Hond…ehh, just kidding. It was actually a total flop. Their large bikes barely sold. In the early ’60s, no leather-wearing outsider wanted to switch from a Harley or Indian to a Japanese bike. While the US Honda team was trying to figure out why no one wanted to buy a Japanese bike, they noticed something unexpected. Urban-living, non-traditional motorcycle riders were taking interest in Honda’s small lightweight bike, the 50cc Super Cub. In Japan, the Super Cub had always been incredibly popular among the urban-living, younger audience. But, Honda decided to ignore that market in the US and try something completely new. Eventually, Honda shifted their marketing strategy to target this urban-living audience. Instead of trying to get traditional motorcycle riders on a Honda, they targeted young buyers who had no interest in the black leather jacket persona. This was the same audience who loved their motorcycles in the Japanese-market — people who just wanted inexpensive, convenient, individual transportation for short trips around town. 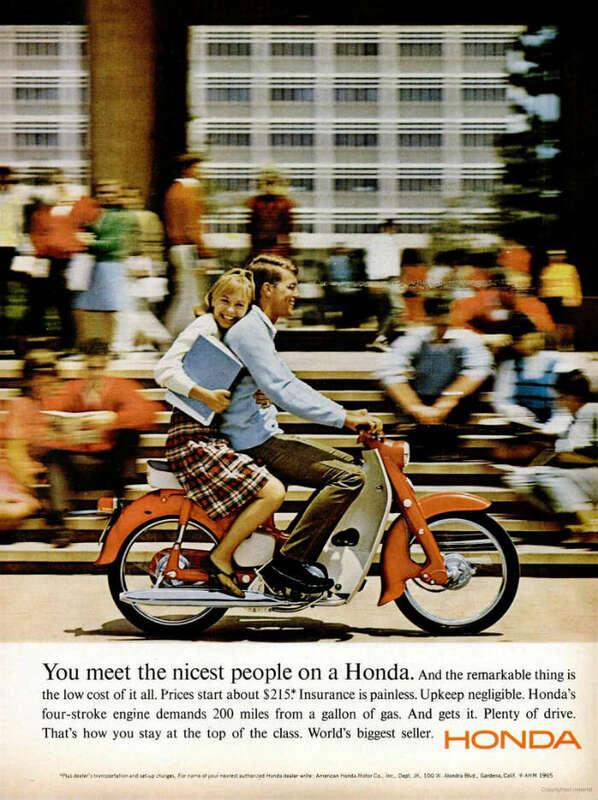 That’s where the famous, “You meet the nicest people on a Honda” ad campaign came from. The Super Cub’s massive US success eventually allowed Honda to move into the traditional motorcycle market, and it wasn’t too long before they captured 63% of the US motorcycle market. Honda almost became a footnote in US automotive history because they didn’t understand their target audience. Luckily, they realized it and pivoted before it was too late. Had Honda originally focused on their strongest audience, they wouldn’t have wasted time and money marketing to an audience who was never going to buy their motorcycles. The author goes on to describe some of their tried-and-true ways to really begin understanding the target audience for your own situation. While no two businesses are exactly the same, these methods will give you the jumping off point needed to create a successful marketing campaign. Sit in on sales calls with your sales team. Pay attention to the questions their prospects ask and how the sales team answers them. Spend time with customer service too. You can learn a ton from both happy and dissatisfied customers. Talk to your customers. For real. Reach out to 10 or 15 customers and ask if you can just talk to them for 15 minutes. Check out online forums. There’s a really good chance that an online community exists for your target audience. Start with Reddit. Do this for 30 minutes per day for 2 weeks. You’ll learn a lot. Read review sites. Sites like Yelp, Google, G2 Reviews, Capterra, etc. can be a gold mine for customer info. You can head to the Carney website here to view the entire article about how audience research is driving marketing today. Need some help with understanding your own target audience? Feel free to reach out to our team to see how we can help. http://www.oliverandsons.com/wp-content/uploads/2019/02/OS-Blog-Images-56.png 400 790 Ariel Phipps http://www.oliverandsons.com/wp-content/uploads/2017/03/logo.png Ariel Phipps2019-02-20 22:10:262019-02-20 22:10:55How Well Do You Know Your Target Audience? There are a lot of social media channels out there, but just because they exist doesn’t mean that your business should be active on it. Companies can sometimes spend way too much time, effort, and advertising budget on social channels that just aren’t right for them. Social Media Channels: Where to Begin, Anyway? With so many social media channels in existence today, it can be difficult to decide which selection or spread might be the best one for your brand. Here, we’ll list some of the most popular social media channels in 2019 with businesses, and (more importantly) discuss how they work to best for businesses. The classic. Facebook has been around long enough at this point to boast friendships on it lasting — at least — ten years. As far as social media networks go, Facebook can proudly label itself the gold standard of the social media community, because its primary goal is just that: building a community. Any business that wants to see any life at all online quite simply needs to have a presence on Facebook. Through ads, mentions, and engagement to a full-blown marketplace, Facebook has skyrocketed in relevance since its inception. Over the years, Facebook’s explosion has created a myriad of opportunity as well as risk. The biggest risk for businesses, though (beyond not creating and maintaining an active profile) is relying on it as a lone vehicle to increase their web traffic. Great for: An up-to-date and well-maintained Facebook page is the first step to establishing legitimacy for any business. At its best, it is a vehicle for online and physical business traffic and is effective for businesses of almost all sizes to build awareness of their brand, as well as establish relationships with their online community. Pitfalls: The popularity of Facebook and the recent changes to its algorithm affects what users see in their feed. Marketers need to be strategic about what they post and when so that their business is well-positioned to reach as many users as possible. It’s almost impossible these days to have a product or service on the market that isn’t in some way marketed through Instagram. And can you blame it? Audiences are intensely visual, and this is a fact that is increasing over time. Instagram relies on this as a method to reach a wide range of audiences. Its newest feature, IGTV, is ever expanding their reach to new levels, in an attempt that rivals even YouTube as it makes its move to position itself as a competitor to streaming giants like Hulu and Apple TV. The strength of Instagram is that it is a fantastic way for businesses to build brand awareness and generate leads through storytelling and real engagement with its audience. Great for: Great for very visual products and services, but also is a great opportunity for marketers to be creatively strategic, as there are so many ways to get creative about showing your brand in action. Pitfalls: Traditionally, it was difficult to make conversions through IG, because the options for direct sales were limited. Things are changing now, as businesses are finding ways around this through the use and continued development of add-ons that make Instagram feeds instantly more shoppable. Twitter has long made its mark in social media by being the long-running voice of the people. Businesses have come to rely on Twitter as a great way to get audiences involved in their brand’s day-to-day marketing voice. Twitter functions a lot like the voice of a brand and is able to provide near to constant communication with an audience. The way Twitter functions allows users to be involved in the day-to-day discourse of trusted figures and brand ambassadors, so Twitter has established itself as a reliable and accessible brand voice over time. This has been expanded even more recently as Twitter has extended its trademark 140 character limit to encompass 280 characters. It seems like a small feat, but in actuality allows for everyday users become reliable brand ambassadors themselves for businesses or causes. Great for: Businesses that need to share news, specials, and rapidly changing information with their clients. Serves also as a great vehicle to mobilize their audience to share brand-specific information with other users. Pitfalls: The sheer volume of tweets on Twitter make it entirely possible to get your message completely lost along the way, which means it never lands where your target audience is most likely to see it. That makes strategic timing and planning of tweets crucial so that your messages don’t end up being, well, just noise. Snapchat isn’t just for kids. Savvy marketers know that even though there are many SM channels that utilize the smart features that Snapchat originated, like disappearing stories and the ubiquitous filter technology, Snap just keeps growing! In 2018 alone, Snapchat was slated to generate over $1.2 M, from advertising and branded content. And those trends show no signs of slowing. What’s the secret behind Snapchat’s success? Well, it’s highly visual and makes use of users’ shrinking attention spans. And for younger users that are saturated with the contrived ads they’ve grown up with, it can be an incredibly effective tool to see branded content in use in an authentic way, by people they can relate to. Great for: Authentic marketing, targeted to a younger audience. This is perfect for larger businesses that have highly visible content, and products or services that can be seen in use. Pitfalls: Snapchat doesn’t currently have the capability to allow users to like and comment on each others’ rapidly disappearing content. So for now, influencers and representatives have to rely on their perceived influence, as it doesn’t foster the more personal engagement that users can find with other social media channels. And as advertising is available through Snapchat, it can end up being costly for smaller to medium-sized businesses. Pinterest is a goldmine for audiences that are looking to get inspired. Try to remember a time before you’ve heard the term “Pinterest-style (wedding/party/living room).” It’s nearly impossible. That’s because this highly visual platform is an effective tool for users to curate their online experience by selecting highly visual content that helps them to create a series of mood boards featuring their favorite photos and products representing a common theme or idea, and all according to their taste. This means that they are more likely to be looking to purchase items or products that they find once they have been added to their curated collections. Why is this huge for businesses? Pinterest utilizes nearly every stage of the traditional marketing funnel to build interest, build relationships between the community of users and the businesses, and to lead potential customers to make purchasing decisions. Great for: It’s great for products because often users want to create a custom list to shop from and Pinterest’s idea boards make products accessible and easy to shop. Pitfalls: Pinterest has a weakness, and which is that it is all too easy for businesses to create spam that erodes user trust over time. Marketers need to be strategic about maintaining links about available products so that users can rely on them, and businesses can maintain credibility. With so many options available, how do you know which is the right choice for your business? Let’s take a look at a few steps that will help you determine some deciding factors to choosing the right option for your brand. This may be the most important step in any marketing strategy. At what part of the marketing strategy are you hoping to reach your audience? Determining whether you are trying to build engagement, or actively convert leads into returning customers will be your first step in deciding which social media channel is right for your business. Who do you want to engage with your brand? It’s so tempting to get ambitious here because it’s natural for businesses to hope to court as wide an audience as possible. But your best strategy here is to build a marketing persona and market to your target audience strategically. Putting some research into who they are, what they would like, and what their needs are will help to determine an effective social media strategy. What’s your audience doing online? And who (or what?) are they engaging with while they are there? This takes the strategy of defining your target audience to the next level. Using analytics tools, and A/B testing will help you to determine what SM channels your target audience (and competitors) are engaging with and will give you a clearer picture of how to narrow down your focus, and strengthen your social media strategy. If you are trying to get your brand out there to reach your audience, you’ve got to know who your audience is, what they are looking for, and how to work with where they are looking online! Knowing the strengths and downfalls of the most popular social media channels will be the first line of attack in determining how to create an effective social media strategy. If you need help determining how to best position your business in the ever-shifting market on social media, don’t be afraid to reach out. We stay on top of the latest in social media trends so that you can do what you do best! Quick…. Think of your favorite brands from your childhood. What do you remember about them? How did they make you feel? We probably don’t spend too much time thinking about why we find certain things more visually appealing than others. But the truth is that those feelings actually have deeper roots than we think. Color is a critical part of all of our experience. We become instantly attracted to or repulsed by the combinations of colors we experience, simply by walking into a room, reading a menu, or looking at a brochure. And yes, this absolutely extends to the decisions we make when we are deciding on making a purchase, both big or small. From logos to landing pages, to print media or full websites, color is something that creates a visceral reaction in humans. We can’t help it! Colors create an emotive response from each of us, whether based in culture, past experience, or personal preference. There is no way that we are not affected by color, even from our earliest ages. No small feat for something that technically, doesn’t actually exist. Color is essentially based in perception, and businesses know this. The way we experience brands are rooted in those perceptions, but even knowing that doesn’t stop the way that we feel when we derive a common meaning from each of those colors. Let’s take a look at some popular brands and how they use color to shape our decision-making experiences. In branding: In some of our most popular brands, we tend to associate the color red with energy, excitement, strength, and passion. Coca Cola uses this perception to their advantage, as they take the top spot as a reliable industry leader in refreshing beverages. Target is adept at using this in its logo to inspire confidence in their customer base that yes, you can find exactly what you need within their doors. In branding: Ah, trusty blue. Few colors are as popular in branding, because blue and its many hues are able to communicate so many different but important messages to consumers. Nothing shows this better than Facebook’s logo. At its essence, Facebook is essentially a space to connect with friends, and nothing conveys this more efficiently than through the use of the color blue. Even Blue Apron is in on the action, as there are few things more relaxing than the comfort of a good meal at home. In branding: Yellow can be a tricky color to brand with, because it can create such distinct reactions in people. At its core though, yellow tends to represent energy and positivity. IKEA utilizes this effectively by featuring the color prominently in its logo. What could be more exciting than the possibility of a creative new beginning for your living space? In branding: We can often find green where we need to express some vitality or freshness, which makes it a really popular color for brands that want to associate their products with health or nature. Whole Foods is a great example of this, and its name has become synonymous with fresh, healthful products. In branding: Well, hello there Orange. Often associated with friendliness, extraversion, and excitement, it’s no wonder brands use orange to inspire optimism in their customers. Check out how Tinder uses the color in its super simple logo to inspire people to use their dating platform. Get out there! In branding: There’s something about purple that inspires a sense of respect. Depending on its warmth and hue, brands often use purple to evoke feelings of authority with their customers. We often tend to associate the color with a sense of wisdom and royalty. Is it any coincidence then, that Hallmark uses a crown in its logo? We think not. In branding: There’s a timelessness to the color black that we’ve come to rely on. Often exclusive, sophisticated, and always impactful, businesses have come to rely on the color to communicate the message of sophistication. Think about how Uber uses black all through its branding, from its logo, to it’s “elite” “black car” upgrades; this message is an intentional one. In branding: Depending on its shade, the color pink can communicate so many things. When it’s soft, its more obvious qualities of romance and femininity are highlighted, and brands like Victoria’s Secret know this and use this to appeal to its clientele. When it’s used at a deeper shade, like magenta, you’ve got a sense of fun and innovation behind it. Think Lyft’s pink mustache campaign, which serves to communicate the direct opposite of older brother and chief competitor, Uber. In branding: Brown is another color that can be so effective when used well and can go so wrong when used ineffectively. It often serves to communicate a connection with nature and a sense of reliability. Brands like Cotton and UPS know this and use the color to craft a message around reliability with their brands. It’s almost impossible to dive into the meanings of all colors, just like it is almost impossible to detail each person’s experience with those colors. But what’s crucial to know is that color is indeed important, and it absolutely has an effect on our deepest and earliest emotional responses. These feelings, of course, affect our buying choices, and even the way we elect to engage with our favorite brands. For marketers, it’s critical that we are taking this unique psychology into consideration when building out brand personalities. If you aren’t sure how to get started making sure your brand’s personality is well communicated, don’t worry! We can help you with that, and more. Hit us up!